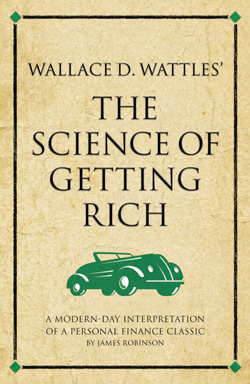 The science of getting rich was written by New Thought Movement author Wallace D. Wattles in 1910. It is his best known work and is based on his concept of the ‘Certain (positive) Way of Thinking’. This new trend for using mind over matter was made even more unusual, yet popular, by Wattles’ application of it to business prosperity, mind training, and success in the material world. Here, James Robinson illustrates the timeless nature of Wattles’ insights by bringing them to life through modern case studies. His brilliant interpretation of The Science of getting rich is an entertaining accompaniment to one of the most popular self-help books ever written.